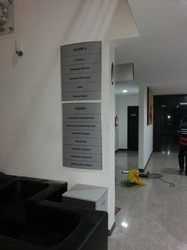 We are leading manufacturer and supplier of Floor Directory Signage. Our offered products are Corporate Signboard, Advertising Signs and Outdoor Signs. We are well known in the market for providing a vast array of Floor Directory Signage to our customers. The signage that we are offering is highly appreciated in the industry for their consistent performance and less maintenance. Moreover, we offer this signage in various designs & customized options as per customer’s choices. Our products are designed and manufactured in accordance with the quality parameters and norms of the industry using the highest quality material. Looking for Floor Directory Signage ?